The label on the device reads ‘footomobile’. Words fail me. Now, I have ridden a Segway (or, as I guess I have to start saying, ‘Footomobile’), and it’s actually tremendously fun. But of course they’re too expensive to be practical. 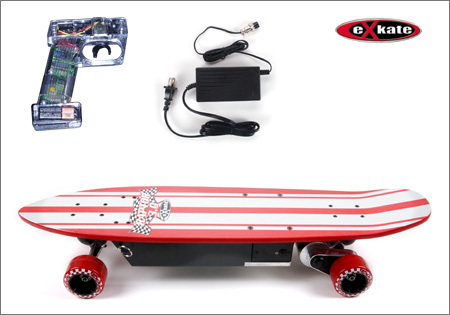 Instead, I’ve found an alternative: electric skateboards. They’re like Segways, but without all that silly safety stuff. I bought two cheap ones off eBay for about $40 each and tried them out. They were fun and worked well for getting around campus, so when I moved to Boston and got rid of my car, I bought a nice one from Exkate for $330 — the Raptor 3.0 model (I swear I didn’t pick it because of the name. They’re just everywhere!). It has a 10-mile range, travels pretty fast (10-15 mph), and recharges quickly. There are other longboard models with longer ranges and top speeds of 20 mph. Zero to twenty in four seconds. Yes. The boards are heavy — mine is 28 lbs, and it’s the lightest they have. They still use lead-acid batteries because they can’t find cheap-enough lithium-ion packs. If they could switch to lithium-ion batteries, they could cut the battery weight in half and up the range to 60 miles. Sixty miles. Man. (Side note: if anyone has lithium-ion packs sitting around and wants a cool project, if you document it well, Exkate might be willing to send you some boards at cost to play with.) Their website isn’t the best, but if you have any questions, give them a call. The guys there have been really helpful, and they’ll give you any additional specs you’re looking for. You can also visit their shop in southern Orange County. Now, the bad stuff: my board has suffered from various mechanical failures, and eventually I had to send it in for repairs. They said it’d take 2-3 days and it’s ended up being a month. I’m still waiting, in fact, but I think it’s finally on the way. Also, I’m a little disappointed the boards don’t hover like the ones in Back to the Future. But I’ve looked at some other companies and Exkate seemed like the best. So, electric skateboards are magical. They’re practical for getting around cities or campuses, and they’re just plain fun to swoop around on. There’s nothing like carving up a hill. I hear Ryan North of Dinosaur Comics rides longboards and might be interested in getting one like mine, so maybe we can start a webcomic-author electric skateboard club. Practically everyone I know has a crush on Ryan, so it’d be interesting to see which was a more effective accessory for picking up girls — the skateboard or Ryan North. I think, in case there’s any question left (I haven’t read all of the posts), that this calendar is definitely referring to the 20th century. 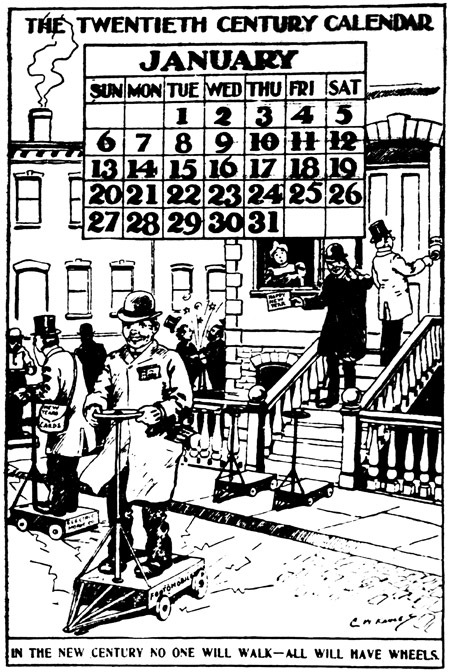 The calendar in the cartoon matches that of January 1901, with the 1st being a Tuesday. Also though, were they predicting that the 20th century would be only one month long? That’s really wonderful and interesting story. Pingback: Everybody has wheels « Ronald! The future looks bleak if there are to be a bunch of fat fucks zooming around on electric skateboards. Ever notice how there are not that many fat skateboarders? It is because pushing wood is great exercise. Can I add this article on my website? Do you mind if I quote a few of your posts as long as I provide credit and sources back to your site? My blog is in the very same niche as yours and my users would really benefit from a lot of the information you provide here. Please let me know if this okay with you. Appreciate it! Has anyone seen the two wheel version. It looks pretty bad as but can’t find anyone selling it or much review. Thinking of buying but that’s $500, anyone used it let me know. Footomobiles content rich and productive. A lot of people will definitely agree that everything in your website is great. The future looks bleak if you will find to be a couple of fat fucks zooming around on electric skateboards. Ever notice how there aren’t that many fat skateboarders? For the reason that pushing wood is excellent exercise. Your blog is very good. Every day I’m on this blog and the many friends I have found here. Glad that you are familiar with my blog. Su blog es muy bueno. Todos los días estoy en este blog y los muchos amigos que he encontrado aquí. Me alegro de que usted está familiarizado con mi blog. Excellently written article, if only all bloggers offered the same level of content as you, the internet would be a much better place. Your web log isn’t only useful but it is additionally really creative. Ho letto il tuo articolo, io sono molto impressionato perché mo ‘di spiegazione abbastanza buona e molto ben informato. Mi piace molto la cara informazioni che offrite nei tuoi articoli.